Herbs. Spices. Amazing Health Benefits. Most people think of the positive health benefits of food they think of the antioxidants in fruits and vegetables; of beta carotene in papayas, kale, and apricots; of omega-3 fatty acids in salmon and eggs. What they don’t think of are herbs and spices, which is unfortunate as these oft-forgotten foodstuffs have some serious health benefits. Many herbs and spices are being examined for their roles as cancer preventatives, antioxidants, anti-inflammatories, blood-pressure alleviations and even weight loss contributors. Here are some of the top herbs and spices everyone should be taking advantage of in their cooking. Cinnamon- cinnamon is the number one spice on my list in terms of health benefits. It contains polyphenols that help lower blood sugar levels by acting like insulin- which is great for people with type-2 diabetes; it can lower LDL and triglycerides as well. Cinnamon is a fantastic natural sweetener that actually works to better your body. Try substituting it for processed cane sugar in coffee, tea or some recipes. Garlic- Another phenomenal ingredient in your spice rack is garlic: especially fresh garlic cloves. Garlic increases the body’s production of hydrogen sulfide, which can prevent or break down certain types of cancer and tumor production. Garlic has proven especially effective against prostate, breast and colon cancers. It can also aid in blood flow, heart and muscle health. Oregano- The biggest antioxidant out of twenty-seven varieties of herbs and spices is oregano. One tablespoon of this aromatic herb has as many antioxidants as three cups of broccoli. Thyme is a great herb as well for antioxidant properties and has been shown to aid in respiratory function. Tumeric- Found in many curries, turmeric contains curcumin, a chemical which may help fight the growth of cancer cells. Many scientists and physicians, including Dr. Aggarwal, a University of Texas professor in cancer medicine, recommend a 500-800 milligram daily dose of curcumin to tap into its cancer-fighting properties. Additionally, turmeric has also been lauded at for its role in brain development and cognitive protection, which could help fortify our thought processing as we age. Rosemary- Inflammation plays a critical role in the development of many chronic diseases, including heart disease, Alzheimer’s, allergies, back pain and other joint pain. Rosemary serves as an effective anti-inflammatory, which, when coupled with healthy lifestyle changes, could help to alleviate chronic pain. Dried Red Pepper- Cayenne pepper and paprika are both derived from a variety of dried peppers, which serve as a secret weapon for dieters looking to lose weight by naturally boosting their metabolism, decreasing their appetites and increasing their satiety. Peppers also boast the presence of the chemical capsaicin. A powerful anti-inflammatory, like rosemary, capsaicin is also ripe with antioxidants that can help fight off diseases and aid in cancer prevention. Ginger- Last but not least, ginger has rich antioxidant properties which have been linked to the reduction of arthritis pain and swelling. Additionally, ginger is great for curing nausea and serves as a natural alternative to Dramamine for alleviating motion sickness. Although powdered ginger is an option that can be incorporated into recipes, fresh ginger root is easier for the body to process. Brew it into tea or stir fry it with vegetables to rush relief to your aching joints or stomach. About the Author: Rose Marie Baker is a nutritionist who believes in better living through responsible eating. When she’s not in the kitchen you can find Rose reviewing herbs and spices online. 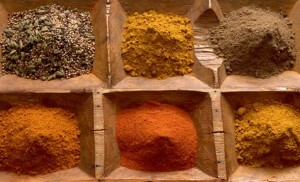 Check out The Spice House’s Indian Spices Page for some of her recommendations. While some people may dismiss herbal remedies as quackery, the use of botanicals is well rooted in medical practice. Ancient doctors methodically collected information about herbs and developed well-defined pharmacopoeias to treat a variety of ailments. More than a quarter of all drugs used today contain active ingredients derived from those same ancient plants.’*^..
Fennel is considered the best herb for improving beauty for women, it balances blood sugar levels, and contains choline which helps the attitude. Another essential herb is peppermint – soothes the stomach if you’ve got a tummy ache, great for smoothies, tea and the breath!